This is one of my favorite formats. The size is 24″ x 48″ . It equals one and one half sheets of watercolor paper. I like it in both the portrait and landscape orientations. Years ago I started streaching my own canvas because you cannot buy pre stretch canvas (or watercolor paper) in that aspect ratio. As it turns out, Home Depot sells a light weight plywood 1/8″ thick in this 2’x4′ dimension. 1. I take that plywood sand the edges. 2. Create sheets of paper to cover the board in what ever fashion suits me. Often this is simple. One full sheet One half sheet. I typically use 300 lb Arches. I never cut the sheets. I crease and tear them, no sharp edges. 3. 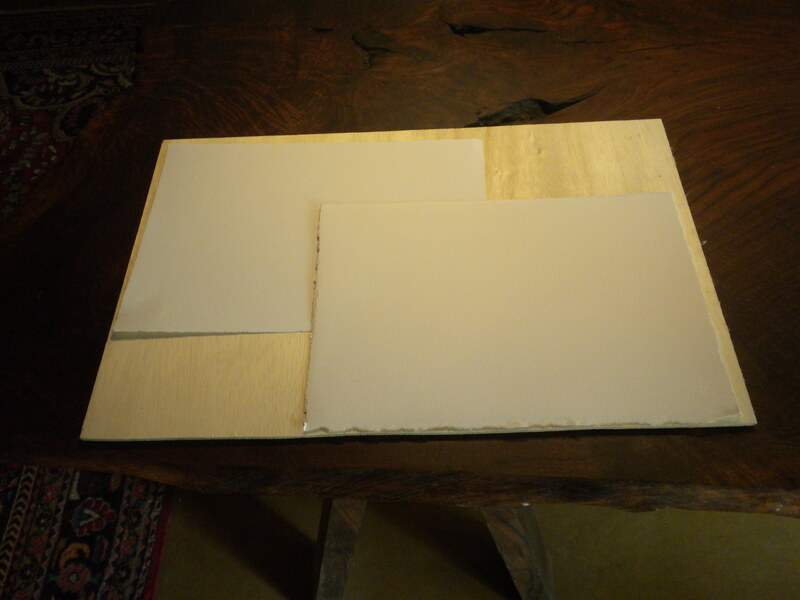 At the same time, I tear matching sheets of an acid free paper (usually stone-hinge) which will go behind the watercolor sheet to create a barrier between the board and the painting. The idea here is to create a finished work of art which preserves the process nature of the artwork while also meeting an archival standard. Bottom line: I don’t want the work to yellow or change over time due to the board on which it is mounted. 4. 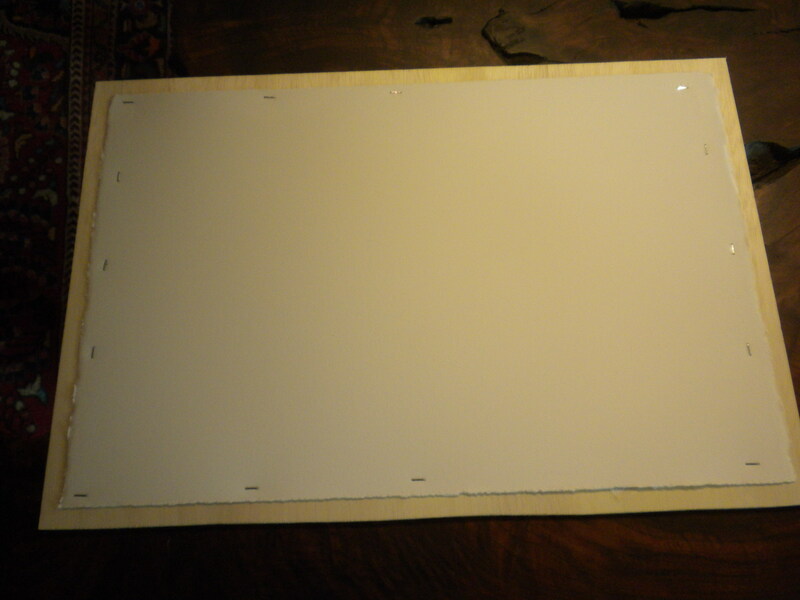 Staple the two sheets of paper to the board. I use Arches 300lb hp or cp. (I don’t usually wet the paper to stretch it, it is heavy enough to hold its own). I always use the same paper. I have experimented with all kinds of paper. This is my favorite. 5. Paint like a wild man. 6. When I decide the Painting is done then I sign and date it with the year. Sometimes I will put a wax stamp or other mark on the sheet. This is the prep. for every finished watercolor coming out of the studio.